Since technology is evolving every day, you may have the opportunity to upgrade your existing business needs and this tutorial is about WebApi Versioning using Routing. Once you have published a successful API, the client/consumers will start depending on it, but change is required as business grows. Requirements are being changed every day and here the idea occurred to me to create a new API without tampering with an existing one. There are various ways to do this, like URL, Custom header, Query String and Accept Header. First, I will cover WebApi versioning using an URL in this section before proceeding. I’d like to share one of the possible situations when you may need this. So let’s dive into it in a practical way. To do this we’ll set a new route for the new version of the WebApi Version number in the URI, considering the most common way of versioning so we can consume a resource by callinghttp://localhost:57888/api/v1/Employees/FetchEmployeeById/1 (the client wants to use version 1 of the API) or http://localhost:57888/api/v2/employeesv2/FetchEmployeeById/1 (the client wants to use version 2 of the API). Notice in the code shown previously there are two new routes and mapped each route with its corresponding controller. In other words, the Route named “Version1? is by default mapped to the controller “Employees? and the Route named “Version2Api” is mapped to the Controller EmployeesV2. Assume we want to add a new version, V3, of the existing WebApi. Then we need to add a new route to WebApiConfig.cs and so on. Before proceeding I’d like to share how WebApi selects an appropriate controller from the current request. 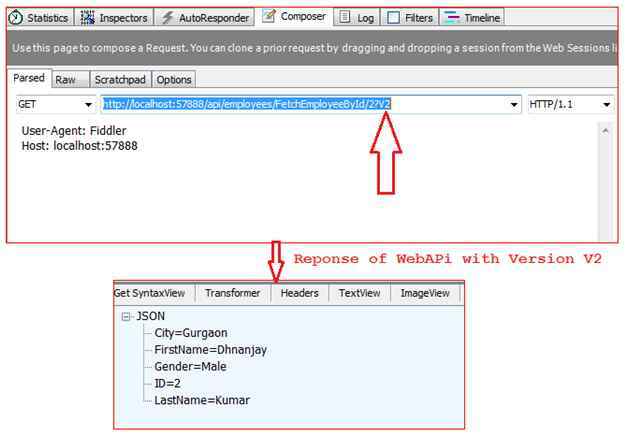 There is a class DefaultHttpControllerSelector that has the method SelectController, that method has the parameter HttpRequestMessage to maintain the information of route data including controller name defined in the class WebApiConfig. Based on this information it fetches the controller/classes collection using reflection derived from the ApiController base class. 7:                     ID =001, FirstName="Sachin", LastName="Kalia"
11:                     ID =002, FirstName="Dhnanjay" ,LastName="Kumar"
15:                     ID =003, FirstName="Ravish", LastName="Sindhwani"
19:                     ID =004, FirstName="Rahul" ,LastName="Saxena"
To test this please press F5 and run you WebApi. 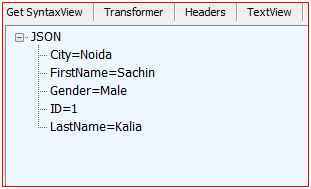 7:                     ID =001, FirstName="Sachin", LastName="Kalia",City="Noida",Gender="Male"
11:                     ID =002, FirstName="Dhnanjay" ,LastName="Kumar", City="Gurgaon",Gender="Male"
15:                     ID =003, FirstName="Ravish", LastName="Sindhwani", City="indianapolis",Gender="Male"
19:                     ID =004, FirstName="Neeraj", LastName="Arora", City="San Francisco",Gender="Male"
23:                     ID =005, FirstName="Rahul" ,LastName="Saxena", City="Hydrabad",Gender="Male"
27:                     ID =006, FirstName="Anshu" ,LastName="Agarwal", City="Noida",Gender="Female"
Press F5 and run you WebApi. WebApi versioning with query string parameter is a simple way to this, because everything is dependent on the query string parameter only. 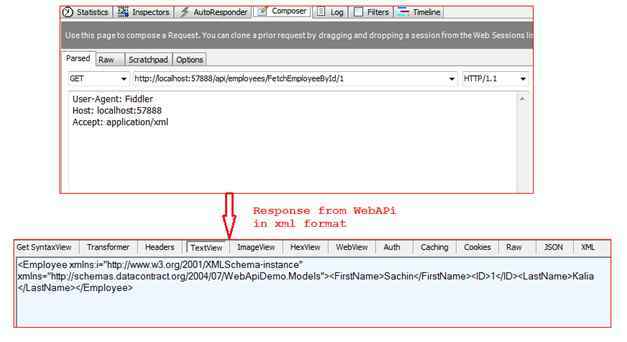 We’ll specify the defined version of the WebApi in the request parameter. Using that parameter the SelectController class will identify which controller I need to call in order to respond to the client. Added a new method into the existing CustomControllerSelector and made small amendments in the SelectController class as shown below in a code snippet. 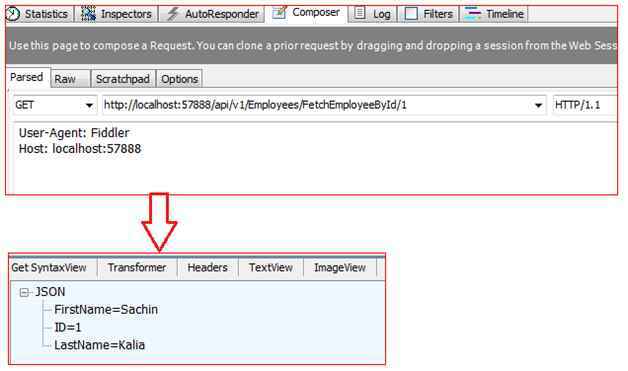 Kindly paste the following URL into Fiddler to verify the working behavior. So far we’ve seen WebApi with the two techniques URL and Query String. The next WebApi versioning techniques with CustomHeader parameter is an easy way to do versioning. For this example we’ve used customHeader Name “Version-Num” that we must send into the current request. 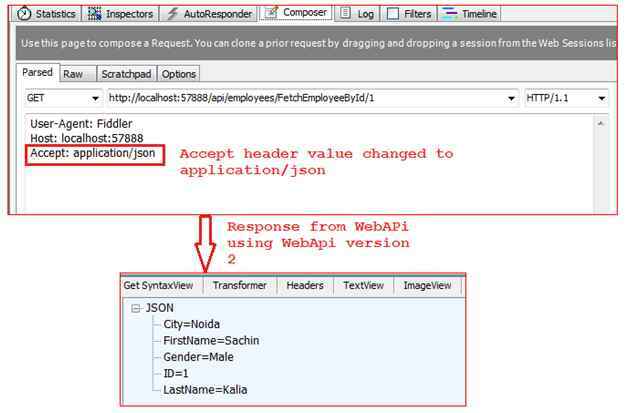 We’ll specify the desired version of the WebApi in the CustomHeader request. Using that parameter the SelectController class will identify the controller I need to call in order to respond to the client. 2: /// Method to Get Header Values. To test this we need to issue a GET request using Fiddler as in the image below, note how we added the new header “Version-Num” to the request header collection. 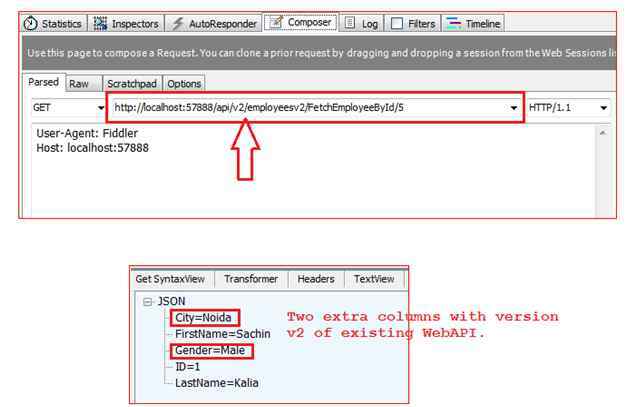 Web API Versioning using Accept Header parameterSo far we’ve seen WebApi with the three techniques URL, Query String and CustomHeader. The next WebApi versioning technique uses an AcceptHeader parameter that is an easy way to do WebApi versioning. For this example we’ve used an Accept Header value Accept: application/json or "Accept: application/xml, that we need to send into the current request. For this approach we’ve added a new method in the existing CustomControllerSelector and made small amendments in the SelectController class as shown below in a code snippet. 2: /// Method to Get Accept Header Values. Note: It might be one of the questions in an interview.